The Jousting Life: Esprit de Corps Dominates at the "Tournament of the Phoenix 2012"
Esprit de Corps Dominates at the "Tournament of the Phoenix 2012"
It is said that a glass is either half full or half empty, depending on one’s perspective. It is also said that every cloud has a silver lining, and every rose has thorns. Since the beginning event that gave it its name, every Tournament of the Phoenix has a theme, and this year it was optimism, hope and fortitude. The changes also brought a few newcomers to the event. ‘When our Marshal couldn’t make it, I threw Mike Loades’ name on the table. Mike has been a huge supporter of our efforts with the tournament, so I thought we had nothing to lose by asking him.’ To the producer’s delight, Mike accepted with enthusiasm. 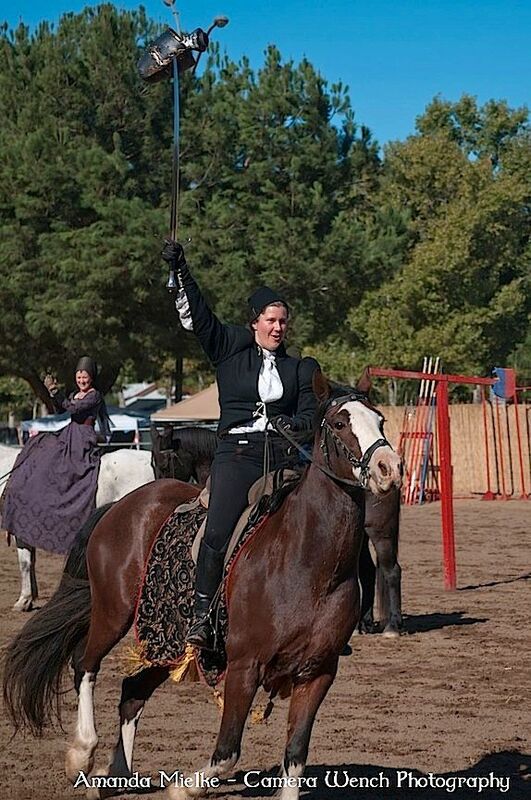 Stable Master Erin Hill scores full points by carrying the helmet in the Helm Strike event. 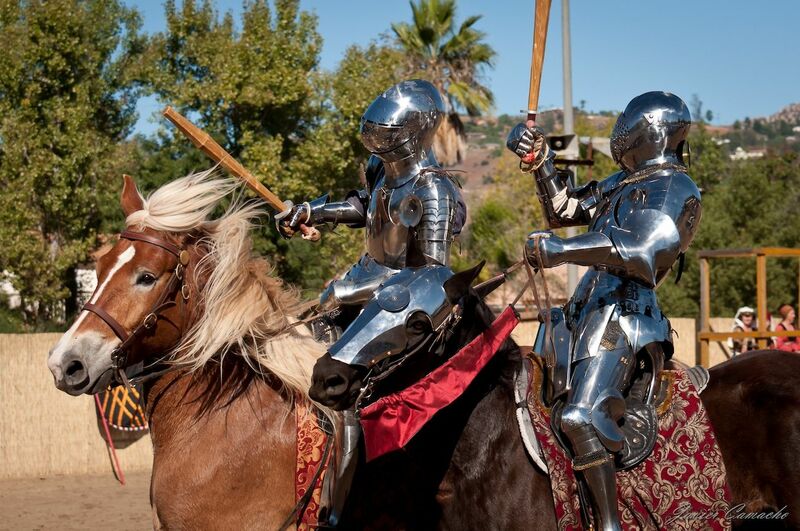 The jousting was nearly bang on from the first course. ‘Steve Mallett’s advance work with the horses really showed in their performance, and they were up to speed almost immediately. Some of the competitors took a little longer to get into the groove’ she says jokingly. Saturday dawned picture perfect as only an autumn day in San Diego can. Crowds lined the rails to cheer on the skill at arms competitors competing in hunting games. Everything was going very well until Head of Ground crew Joel Hill took a spectacular spill in the Drag Target event. Proving that judges can have a sense of humour, Joel was given bonus points for his dismount! 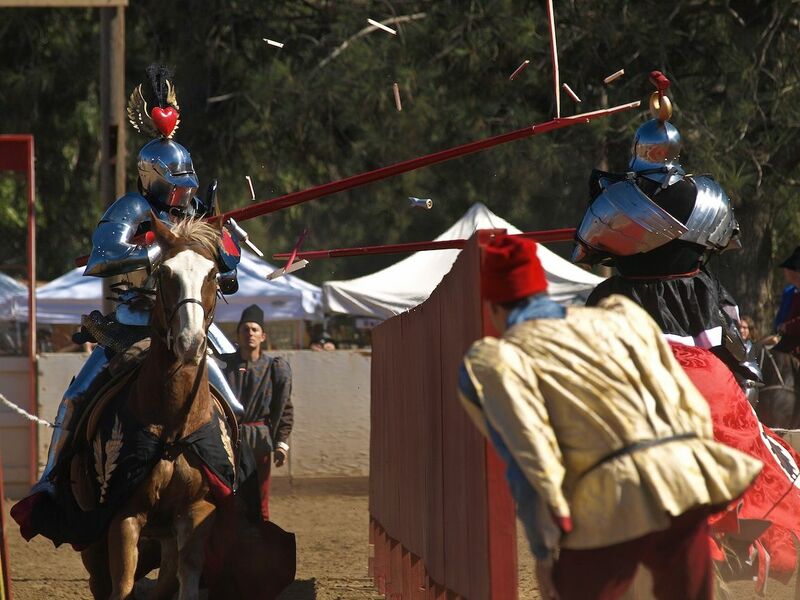 Saturday’s first joust went by the book. The crowds welcomed Jeff Hedgecock with chants of ‘U-S-A! U-S-A!’, and Steve Mallett with ‘Ham-mer - Ham-mer!! The 18 courses were run like clockwork, with many fine strikes and hard hits that had the crowd on their feet cheering and whistling. At the end of the first scored event, Jeff Hedgecock took the lead with a score of 19 points. Sean George(L) and Steve Mallett(R) create a shower of splinters during a pass while Scoring Judges JP Clamme(R) and Darth Rimmer(L) watch closely. The next scored event was the pollaxe competition. 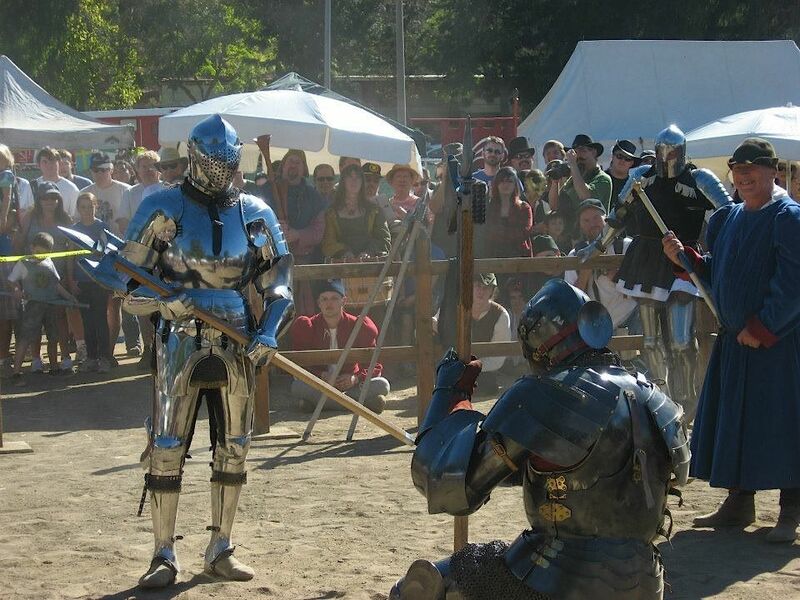 There were many fine fights and impressive displays of martial prowess, as competitors battled round after round in the unaccustomed heat. When it was clear that competitor Toby Capwell was flagging, opponent Marc Hamel yielded the field. Although acknowledged as a fine display of chivalry, fierce competitor Toby refused the concession and fought the last point. The bouts continued until competitor Marc Hamel was struck below the eye with a pollaxe. The crowd stood in hushed silence as Marc knelt in the arena clutching his face. The on-site medic ran to his aid, and a sigh of relief swept thru the crowd when it was announced that although the injury was severe, Marc ‘s eye was all right. The battles continued, with Steve Mallett emerging victorious with 4 points. 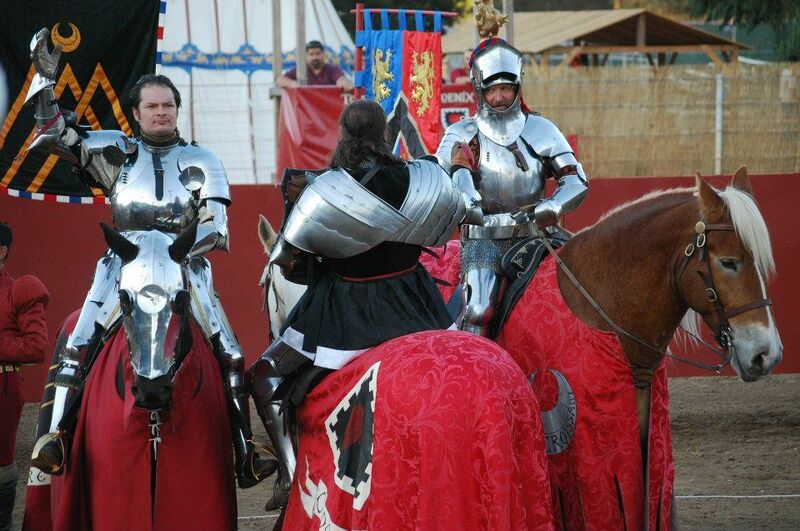 The second session of jousting saw Jeffrey and Toby jousting for Marc Hamel when the medic recommended Marc not compete any more that day. Jeffrey and Toby ran fine courses, earning a very respectable 13 points for Marc. The session closed with Jeff Hedgecock in first place with 17 points. 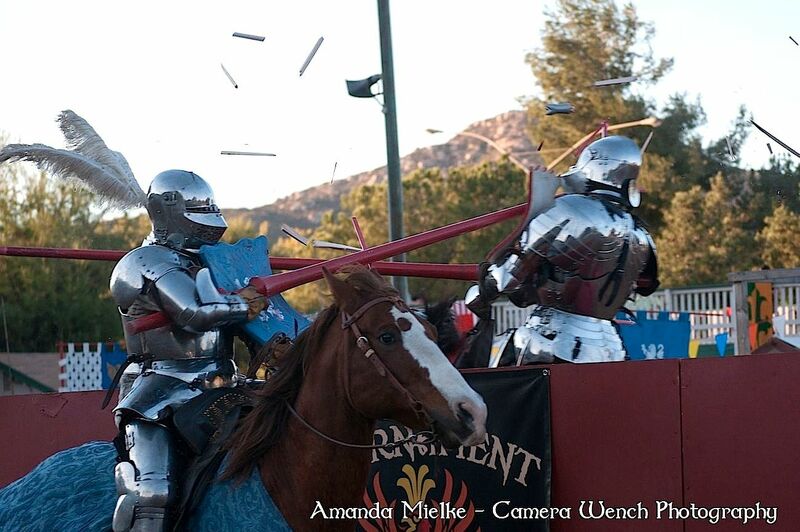 Toby Capwell jousts for Marc Hamel wearing Marc’s shield. At the end of the first day of competition Jeffrey Hedgecock was in front with 38 points, Steve Mallett in second with 32 points, and Marc Hamel in third with 30 points. Sunday was another gorgeous day, and the crowd was ready. The final day of the skill at arms competition were the martial games of quintain, helmet strike and cut/thrust, which was won by Scoring Judge Darth Rimmer. Sunday morning, Steve Mallett was overcome by the heat while working with a troublesome horse, and withdrew from the session. 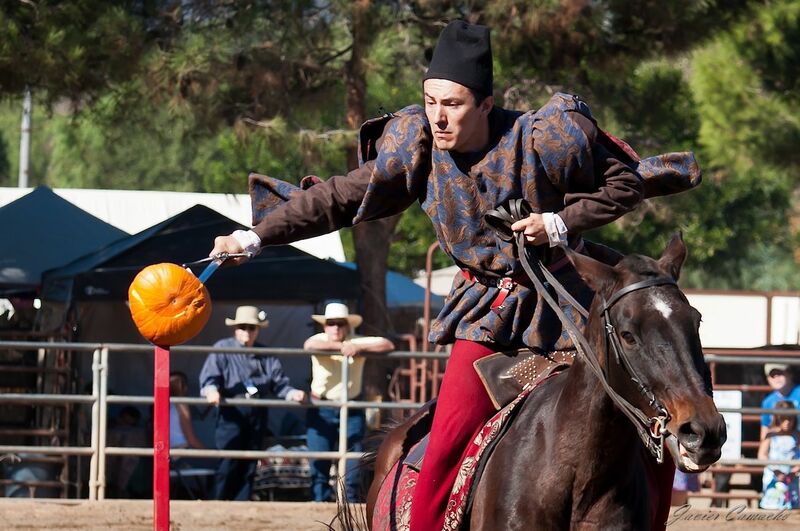 Jeff stepped up and jousted for Steve, earning Steve 17 points. Again, competitors landed many hard hits and scored many breaks that sent lance shards and coronels flying high into the air, much to the delight of the enthusiastic crowd. Competitor Sean George found his groove, and scored 19 points to win the session. 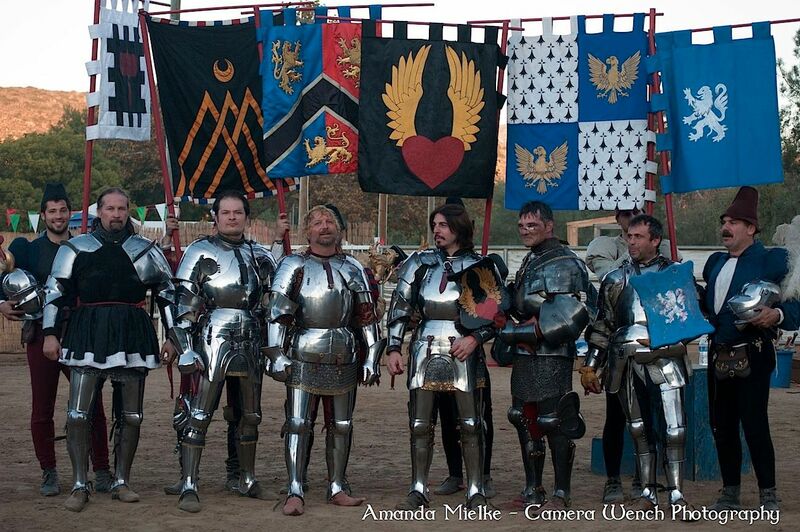 The 5th event of the tournament was the Club Tourney. The Lady of Honour exercised her rights and judged that due to his injury Marc Hamel should not compete in this grueling event. 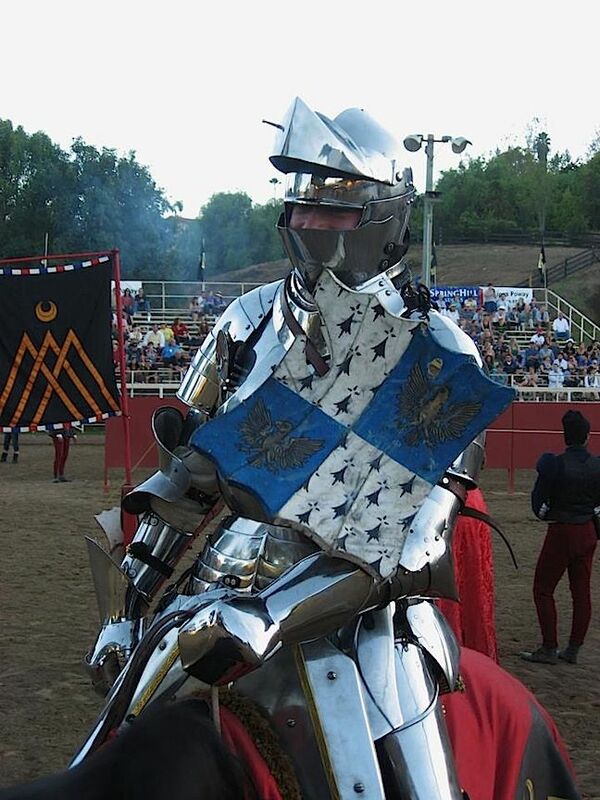 She appointed Marc Knight of Mercy; in this role Marc would be sent in to ‘rescue’ any competitor who was overcome, or whose horse appeared to be struggling. Darth Rimmer asked for the honour of competing in the club tourney for Marc. The Lady Judges agreed, and Darth rode for Marc. 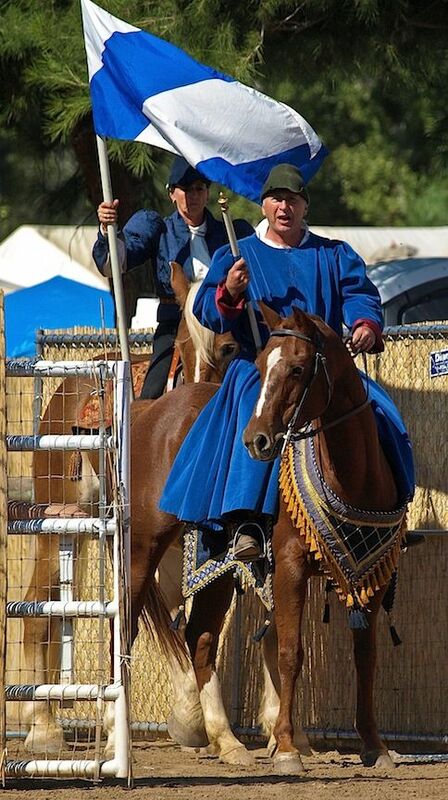 Marshal of the Field Mike Loades recounts the Club tourney- ‘the mounted club tourney was absolutely thrilling, with the whole pack of riders constantly swarming from one end of the field to the other at a fast canter, belabouring each other with solid blows as they did so. There was great tactical play as the action swirled with unrelenting intent. All became exhausted at about the same time.‘ This event has no quantifiable method of scoring such as blows struck; rather, the Lady Judges rank the competitors according to their horsemanship, horse management, tactical ability and courage. Steve Mallet emerged victorious and was awarded 12 points. Jeff Hedgecock and Toby Capwell tied for second and were given 9 points each. The competitors entered the last scored event with Steve Mallett in first place with 61 points, Jeff Hedgecock in second with 57 points, and Toby Capwell in third with 50 points. Sean George, Marc Hamel and Luc Petillot trailed with 49, 44 and 35 points respectively. ‘Woo hoo!’ could often be heard from inside helmets as competitors streaked down the tilt. When the final score was announced, Steve Mallet was the winner, with Jeff Hedgecock one point behind in second place. Having fallen quite hard in practice on Thursday, and then riding 3 different horses on Sunday, for a total of 4 horses over the 3 days of the event, Steve felt Jeff had fought hard and performed well, so asked Marshal Mike Loades and Lady of Honour Kyle to declare it a draw between [Steve] and Jeff. The Judges agreed, and the competition was declared to have 2 winners. Group shot of the competitors L-R: Steve Mallett - England, Tobias Capwell - England/USA, Jeffrey Hedgecock - USA, Sean George - England, Marcus Hamel - Canada, Luc Petillot - France.